Sandra 'Sandi' Kay Coates (Anderson), 68, passed away Monday, November 17, 2014. Born to Donald and Bernice Anderson in Sandpoint Idaho; the second eldest with five siblings Judi, Don, Gene, Connie and Pam. 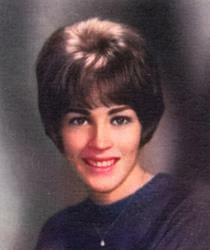 Sandi attended Moscow High School and later the University of Idaho. One of the many highlights of her life was being nominated as a candidate for Woman of the Year 1969, appointed to the Royal Court. Sandi was very active in the Beta Sigma Phi sorority in Challis Idaho. Throughout her years she was passionate about volunteer work, supporting schools and her community. Sandi's dedication to her family was beyond words. Sandi enjoyed doing arts and crafts with her grandchildren, party planning, music and outdoor activities, all while perfecting the "double back flip." Sandi flowed through life with a heartening attitude and a smile on her face. She had a contagious laugh and warmed the hearts of everyone she met. She is preceded in passing by her daddy Donald and baby brother Genie. She is survived by her sons Robert, William (Sara), Sean (Jen), Matt (Kurstin), daughter Angie, nine grandchildren, and seven great-grandchildren. She will always be known to her family as their rock, foundation and guiding light. She will be greatly missed, loved and carried in our hearts forever. A Celebration of Life Memorial will take place later and be announced in the upcoming New Year. In lieu of flowers, please make donations in her name to The Moose Lodge of Moscow Idaho.